This past week as I reflected over 2014, I was amazed at where this year has taken me. When I took on the word “LAUNCH” as my one-word for 2014, I couldn’t have imagined just what I was launching into. Never dreamed I’d start a blog. Couldn’t imagine the ways I’d begin to rewrite my life story. Last December, I didn’t want LAUNCH as my word, but I couldn’t seem to shake it. It was scary, filled with action and sure to take me away from the familiar and into the unknown. Even so, I began to embrace it throughout the year and said “yes” to a number of new things all in the attempt to LAUNCH into something new. Most significantly, I LAUNCHED this blog. Sharing my writing with others, building this community, meeting so many others online. This LAUNCH has changed me in ways I’m still uncovering. I thought maybe this year I’d get an easier word. Maybe take a year off from such action-filled words. Maybe something like PEACE or REST or JOY. But, that probably wouldn’t be fitting after a year of LAUNCH, would it? So, what is the word I can’t seem to shake this year? The word God is placing on my heart? 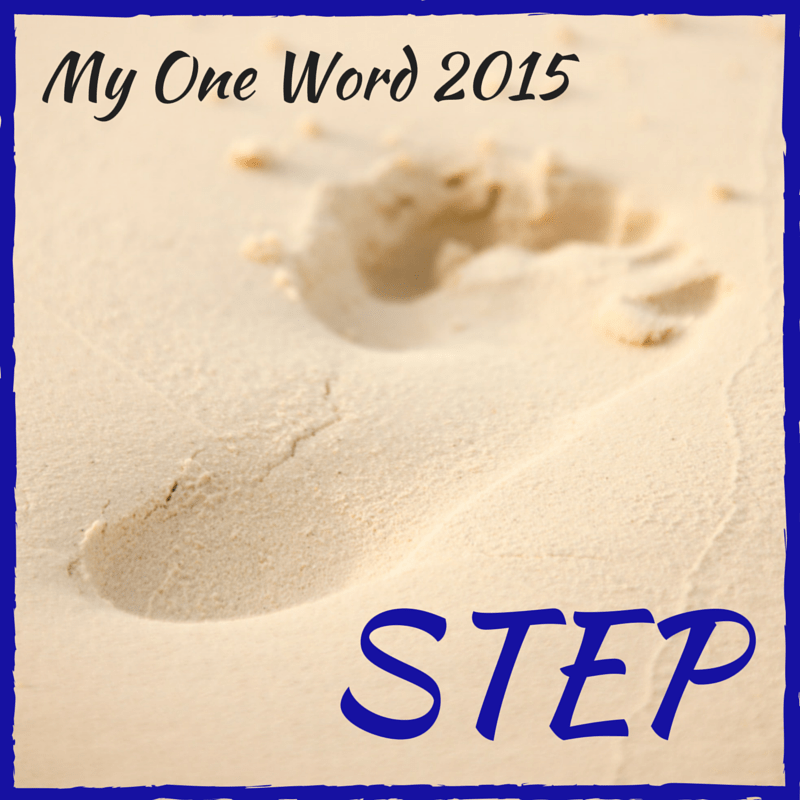 My one-word for 2015 is STEP. I can only imagine it will be a year filled with STEPS, taking one STEP at a time in faith. STEPPING into something new. To that end, I’m taking my first STEP today. I’m committing to dig deeper in my writing and take on important questions about “Why Does Faith Matter?” As a former skeptic and, at times, non-believer, I’ve discovered a level of faith that’s both essential and life-changing. But, what is it about faith in Jesus that’s so life-altering? Why does it make a difference? Why should we whole-heartedly embrace Jesus and the Christian faith? Why does taking Sabbath rest matter and how is it more than just “me time”? How can prayer become more than just an item on your to-do list? More than just a “hail Mary pass” when you’re desperate and nothing else seems to be working? How can faith bring hope and joy into your life, even when your life’s circumstances are anything but hopeful or joy-filled? How is life-altering faith more than just believing in God and going to church on Sunday mornings? What does it mean to truly follow Jesus? I will be taking another big STEP in a few weeks to speak at a women’s conference. It’s one thing to pour out my heart here where I can edit and get the words just the way I want them, but another thing entirely to speak to a group. I’m really excited about the opportunity, but would appreciate your prayers for a steady voice and a clear message. As I look out on 2015, I’m both reluctant to begin writing again – unsure if I’m really cut out for this – yet also excited to come off this writing break and share what’s been stirring in my heart. In any case, I look forward to see what STEPS God has in store for me this year. I’m sure they won’t all be easy ones, but I am sure they’ll take me closer to God’s better future for me. What about you? What is your one word? Will you allow God to place a word in your heart to guide you in this next year? This will be my third year to choose one word, instead of setting goals or resolutions – and it’s been transformative each year. For more information on My One Word, click HERE. « Be Bold and Pray For Miracles! I look forward to being in step with you during portions of our journeys in 2015. Wonderful word! And yes, I pray God will use you mightily to speak the message He designs for the women at the conference. Many blessings! How exciting to see what God will do in your life this year as you step into His will, direction, and call on your life. Thanks for linking up to Testimony Tuesday! I’ve been praying about it and I think my word is “Trust,”…before I can take the step, I have to reach out and take his hand. Looking forward to walking with you into a new 2015! Much love my friend!! I love the word “trust” – that sounds like a great word for you this year. Will be praying for you to embrace it and live into it. Look forward to journeying through 2015 with you, too! How exciting, Kathryn! God will lead you mightily if you ket Him and I can’t wait to read more this year. My word is “shine” which I was thinking just a few days ago wouldn’t be that hard. I have already found out that for God this means so much more. In order to fully shine for God I need to get real with myself and in certain areas of my life and one of these things will be in what I write about this year on my blog. I certainly don’t know how this will look yet but I know I will be stepping out of my comfort zone. Prayers for all as we venture into this new year with open eyes and hearts for God. I don’t guess any word is really easy – God doesn’t call us to easy, He calls us to growth and more than we can do on our own. Praying for all that “shine” will mean for you this year! I’m excited, yet a little nervous, to see just where “step” will take me this year. Thanks for sharing LAUNCH with us! Look forward to a year of STEP! Thanks, Deb! Love your posts and photos from your travels! Hope you’re having an amazing trek. God’s got this sister! He is able to keep that which you have committed to Him. Thanks for allowing Him to minister through you. Love this!! Every step forward is a step! regardless of how big. Praying for great delight as you speak, as you step forward, as you live out your Word, Kathryn! Linda, thank you for the prayers as this new year of bold steps begins! Prayers also for you in this new year! Hi Kathryn! I’ve missed your posts. I appreciate your word, “Step.” congratulations on taking new steps as a speaker and writer. May the Lord give you grace as you speak at the upcoming conference. I love your list of “hard to tackle” writing topics. Look forward to hearing more! Oh, Betsy, your words were such encouragement today! It’s been good to take a little time off (plus recovering from the flu which knocked me out for a couple weeks), but excited to get back to writing. Thanks for the vote of confidence! I need it 🙂 although, I’m still feeling more excited than nervous, so hoping that continues. OMG, these themes work! I can attest to that. My 2014 was a year of MORE. So that’s what I got. I visited more places, I read more books, I tried more things, I just had an awesome year of more. This year is my year of breakthroughs and boldness. And I can’t wait for 2015 to give me that. Love the confirmation on the themes I’m targeting – and so awesome about your year of MORE! Prayers for your next year of breakthroughs and boldness! Go for it!!! Not a word I really wanted – I know it won’t be an easy one to live into – but I trust it does mean good things ahead. Following God one step at a time! wow, Kathryn, when i read the questions you asked, i kept thinking, i hope that as you journey through Finding Spiritual Whitespace – the book – you’ll discover some of these answer… because these are the same questions i asked myself and shared the journey in uncovering them. it’s so interesting how God puts words on our hearts that we would not have chosen. but that’s the joy: knowing they were placed there. by the one who calls us Him. 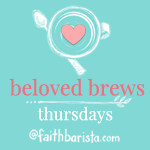 thanks for linking up your one word STEP in the #belovedbrews. enjoyed it much. Oh, I absolutely LOVED your book! In fact, I have it listed as a resource and we’re giving away a copy at a women’s retreat this weekend about “Be Still” – finding stillness with God. As soon as we started talking about this as a theme, I told the rest of the team they HAD to read Finding Spiritual Whitespace. I’m looking forward to putting words to what I believe – I think that’s the biggest challenge ahead for me – to boldly proclaim and describe what it is I believe. I love the word the Lord has chosen for you! When I first saw it, out came an involuntary ooh! All journeys begin with a step! Our preacher always says “take a step, take a step.” That’s how we walk in faith – one step at a time. Think I must have a lot of steps ahead in this journey!